Russian archpriest; convert to Judaism; born probably in Novgorod, 1425; died in Moscow, 1488. 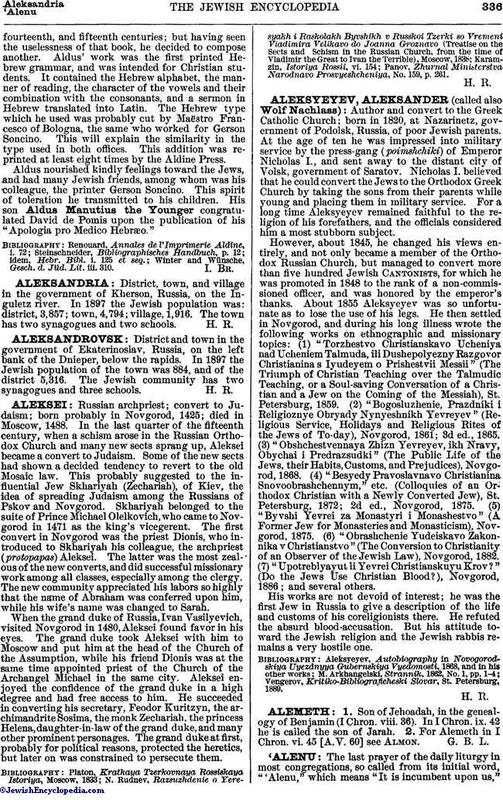 In the last quarter of the fifteenth century, when a schism arose in the Russian Orthodox Church and many new sects sprang up, Aleksei became a convert to Judaism. Some of the new sects had shown a decided tendency to revert to the old Mosaic law. This probably suggested to the influential Jew Skhariyah (Zechariah), of Kiev, the idea of spreading Judaism among the Russians of Pskov and Novgorod. Skhariyah belonged to the suite of Prince Michael Olelkovich, who came to Novgorod in 1471 as the king's vicegerent. The first convert in Novgorod was the priest Dionis, who introduced to Skhariyah his colleague, the archpriest (protopapas) Aleksei. The latter was the most zealous of the new converts, and did successful missionary work among all classes, especially among the clergy. The new community appreciated his labors so highly that the name of Abraham was conferred upon him, while his wife's name was changed to Sarah. When the grand duke of Russia, Ivan Vasilyevich, visited Novgorod in 1480, Aleksei found favor in his eyes. The grand duke took Aleksei with him to Moscow and put him at the head of the Church of the Assumption, while his friend Dionis was at the same time appointed priest of the Church of the Archangel Michael in the same city. Aleksei enjoyed the confidence of the grand duke in a high degree and had free access to him. He succeeded in converting his secretary, Feodor Kuritzyn, the archimandrite Sosima, the monk Zechariah, the princess Helena, daughter-in-law of the grand duke, and many other prominent personages. The grand duke at first, probably for political reasons, protected the heretics, but later on was constrained to persecute them. Panov, Zhurnal Ministerstva Narodnavo Prosvyeshcheniya, No. 159, p. 261.